2 Tbsp. chopped fresh basil – I used pesto, scrumptious! No marinara sauce in the house? Here’s an easy solution – canned crushed tomatoes. I use them all the time. Open the tin and use as is, or spice it up a bit with browned onions, garlic, fennel seeds, and freshly cracked pepper. Voila – ‘homemade’ marinara for pennies. This entry was posted in cooking recipes, eating, home, simplicity and tagged cooking, food, frugal dinner ideas, home, mariana sauce, photography, stuffed shells by ripe red berries. Bookmark the permalink. Oh, this sounds so good! I haven’t has stuffed shells in ages. I think I’ll have to make some soon. I’ve only made them a few times myself and wonder what took me so long? enjoy! That looks so good! 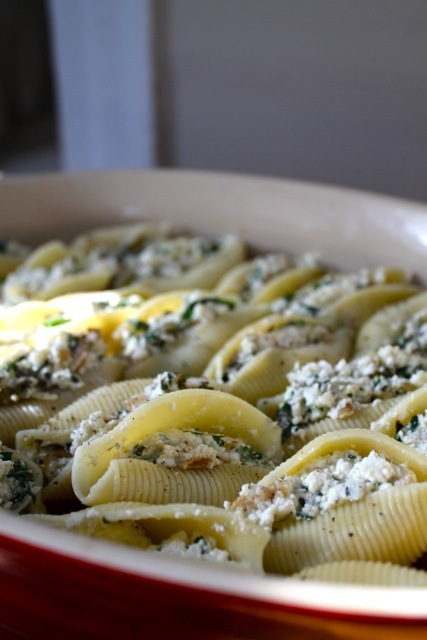 We love pasta dishes, especially in the winter. It’s the ultimate comfort food at our house when the temps are hovering at zero. Thank you! Yes, pasta in the winter is often served in our home too during these long, cold days of winter…enjoy! Great comfort food for the winter. I couldn’t agree more! thanks Norma!